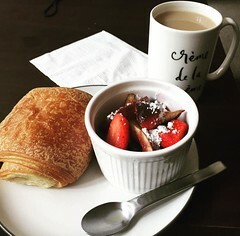 So, there’s been a lot going on in the past few weeks- well since March really but now that we’re nearly settled—and I use that term loosely, I think it’s almost time for me to start cooking again. I say loosely settled, because the ground floor is box free and all suitcases are unpacked—but this is not a permanent situation. I’m away for every single weekend in May and there are still boxes galore on the top floor. However, the kitchen is unpacked and as The Runner suggested, it could be a good time to get back into the true purpose of the Blog- Sunday Dinners. 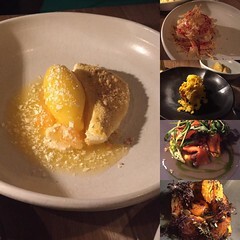 What some people don’t know about The Runner is that he has a very active imagination- especially when it comes to food. He has a very endearing habit (sometimes) of dreaming up very inventive meals and expecting me to deliver….and I have a pretty good success rate, the popcorn and chocolate chip cookies were a success and really, despite the eye rolls (mine), there have been few, if any failures….although it has taught me to think twice before I ask him what he wants for dinner. Special note, it does help to have a library full of cookbooks and the internet to rely on when his creative menu demands come up. Weirdly enough, The Runner had never heard of Huey. He’s only been in Australia for 5 years and didn’t have the luxury of studying here and not having to work during the day. I think of Huey as the original Australian (or Kiwi) Celebrity Chef. 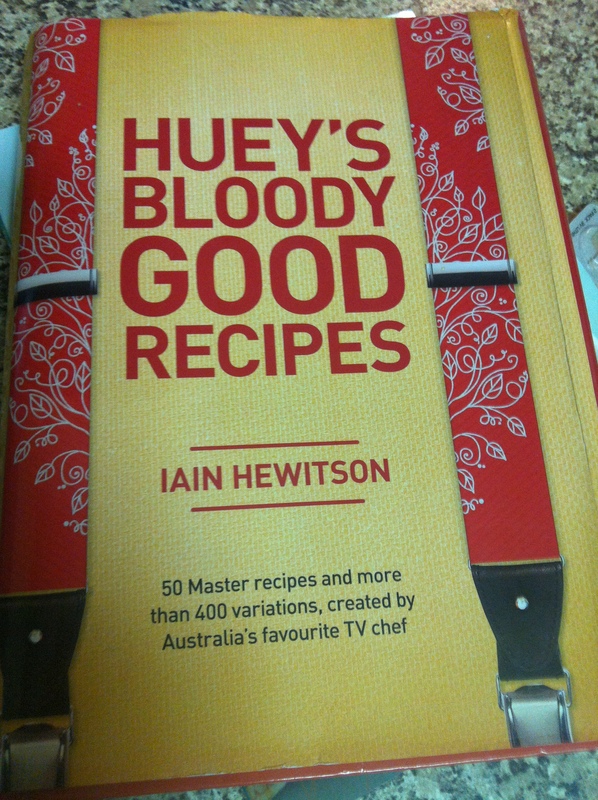 Before George Calombaris, Matt Moran, and the other chefs that are staples on our TV sets, there was Huey. Slightly overweight, constantly making jokes and spruiking products, he paved the way for a whole generation of famous chefs. But where has he gone?? I’m actually quite curious to know! Well, his Wikipedia entry is pretty short- –http://en.wikipedia.org/wiki/Iain_Hewitson. But as far as I can tell, he’s still doing his Channel 10 TV show, and well, being a TV chef. Come to think of it, I have seen him on Channel Ten when I’ve been home sick, I just didn’t realise they were new shows. So, here we go…. 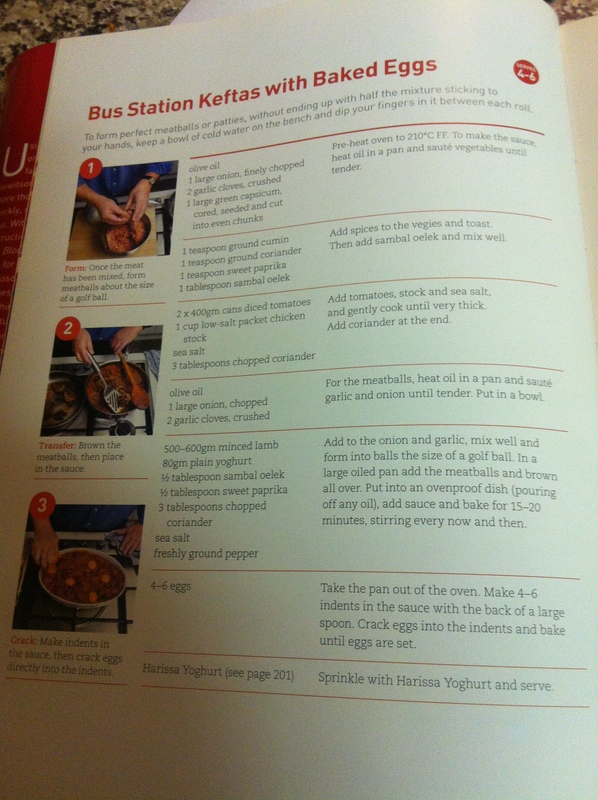 Huey’s version of Koftas is actually called Bus Station Keftas with Baked Eggs. I’m not sure about the spelling but I’m going to do them with a brown rice salad on the side as well. First is making the sauce—I start by sautéing onion, garlic and capsicum in a pan until they’re all tender. Small disclaimer, for the first time in ages, I have an electric stove and not gas, I now remember why most cooks prefer gas. Rant over. While the veggies are stir frying I grab ground cumin, ground coriander and sweet paprika. 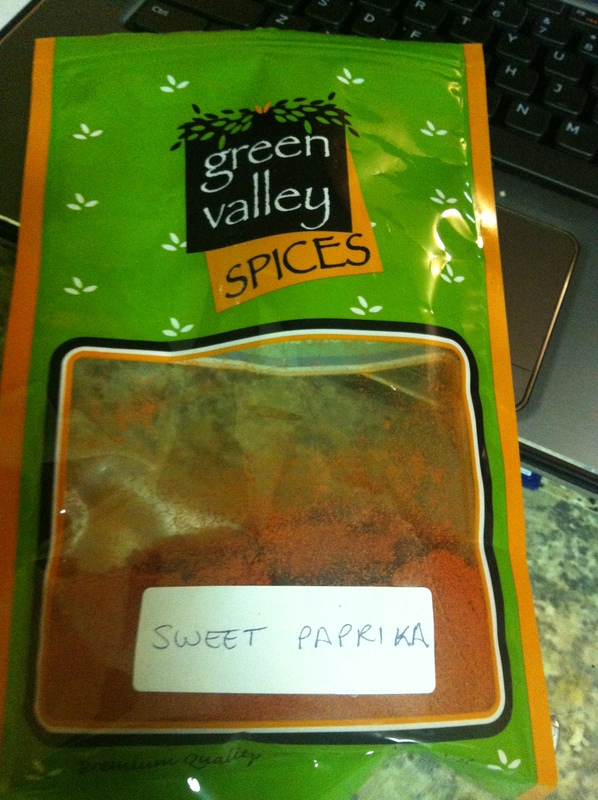 1, there is an excellent shop that opened recently in Royal Randwick Shopping Centre, Green Valley Spices, basically it looks like a spice market with bowls full of fresh and exotic- well not that exotic spices that you can order by weight. Very cool, I highly recommend them. http://www.greenvalleyspices.com/ They also do teas and not sure what else. 2, everytime I look at my spice shelf, I’m reminded of how similar The Mom and I are. Much like The Mom, rather than checking what I have at home, I often buy new spices when I need one for a recipe, resulting in multiple jars of ground cumin, lemon pepper seasoning and any other seasoning that I cook with often. True story, I once went home to DC, and found 5 different jars of Morton’s Season All Seasoned Salt- it’s my mother’s staple seasoning…. And she had it stockpiled! Why, I’m not sure, thanks to The Mom, I’m sure it’s Morton’s most popular product. I add the cumin, coriander, paprika and sambal oelek and mix on the stove. 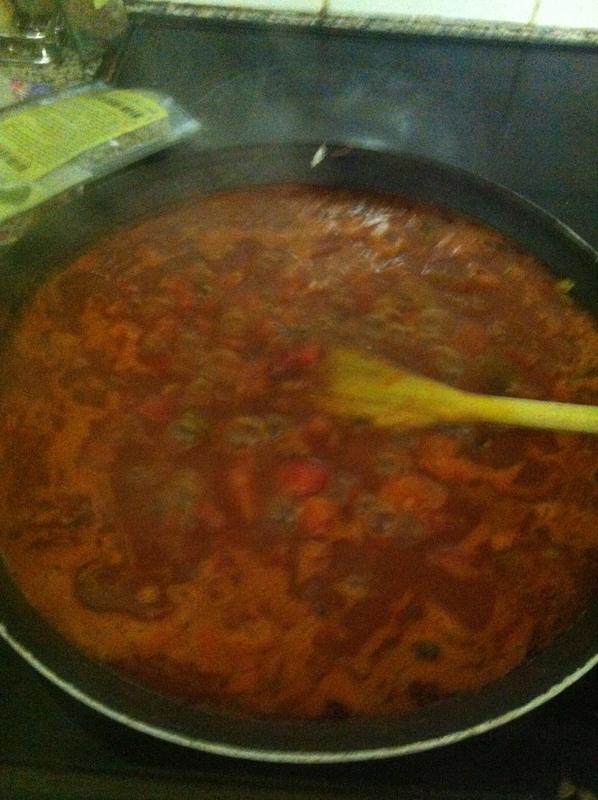 Then I add two cans of diced tomatoes, 1 cup of chicken stock, and a bit of sea salt to taste and cook until it’s thick. 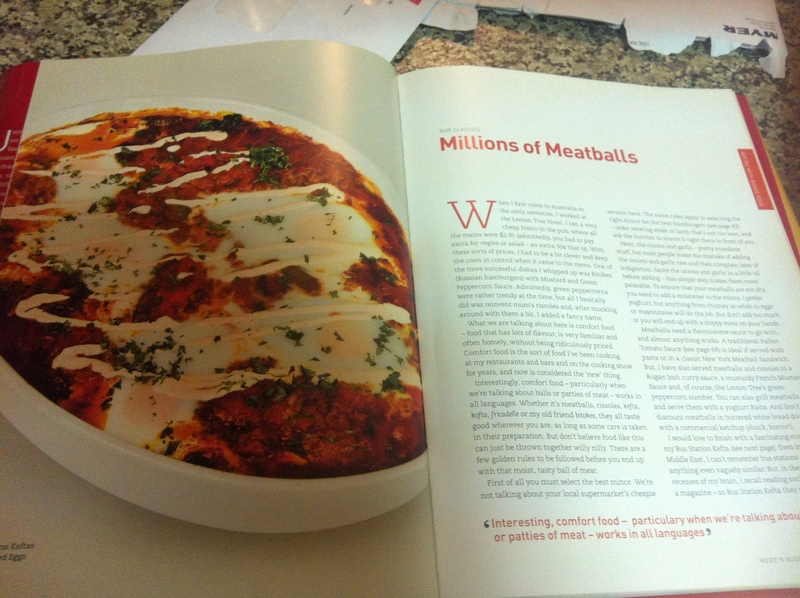 While that’s cooking, I make my meatballs. First, I sauté onion and garlic together in olive oil. Apparently, by sautéing the onion and garlic first, it’s less likely to give you indigestion—according to Bill Granger’s cooking show on Foxtel earlier. Then, Huey’s instructions get quite unclear. He lists ingredients like plain yoghurt, sambal oelek (again) and more sweet paprika but doesn’t quite say what to do with them. So frustrating! I’m guessing that they go in to making the meatballs but there’s no way to be sure. I’m going to hedge my bets and do it but I HATE unclear instructions like this! I make the meatballs and then put them in the pan to brown. Ok, this is the third time I’ve cooked in this kitchen and I will say that the most annoying thing about it is the size of the burner- you can’t fit four pots on the stove and my big fry pan doesn’t fit. Half of it heats and the other doesn’t! Groan!!!! 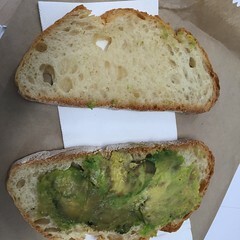 It’s a first world problem, I know, but as a resident of the first world, I’m complaining about it. Sorry, deal with it. I put the meatballs in for 17 minutes, realising that the brown rice only has 10 minutes left plus 5 minutes resting. It’s ok because I still need to put fetta, lemon juice, olive oil, and parsley through it after it’s done cooking. And a quick squiz at it cooking away, I see that it’s nowhere near ready. Must be time for a glass of wine….and to make the Harissa yoghurt that goes over the finished dish. I don’t follow Huey’s recipe for the Harissa yoghurt, I just squirt some Harissa paste in with some yoghurt. 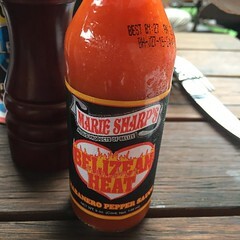 It’s not that spicy so I squirt some more in….Huey wants me to make the paste from scratch…. I disagree, especially when I have Harissa paste in the cabinet that I don’t know what else to do with! 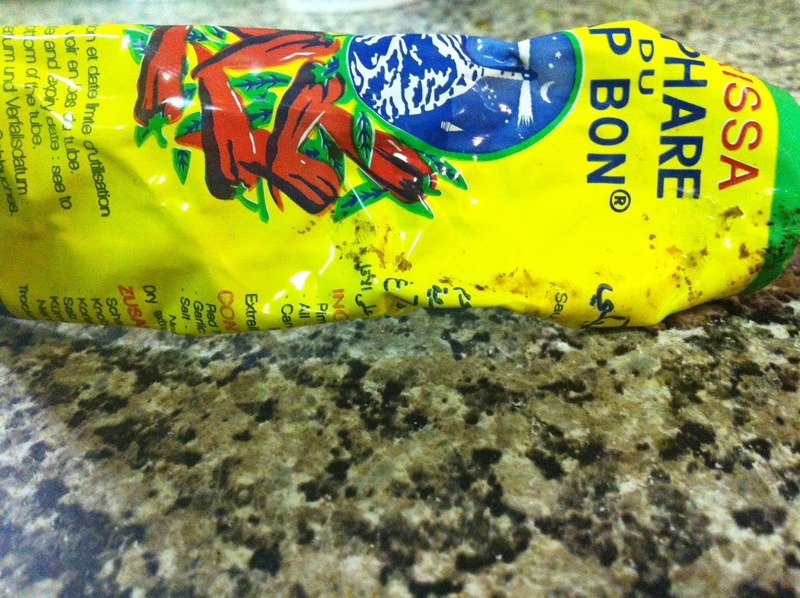 Another side note, be careful tasting Harissa paste, it’s spicy. I learned the hard way, thank me later for the advice. Once the meatballs came out, I make 4 small wells into the mixture break four eggs into it. 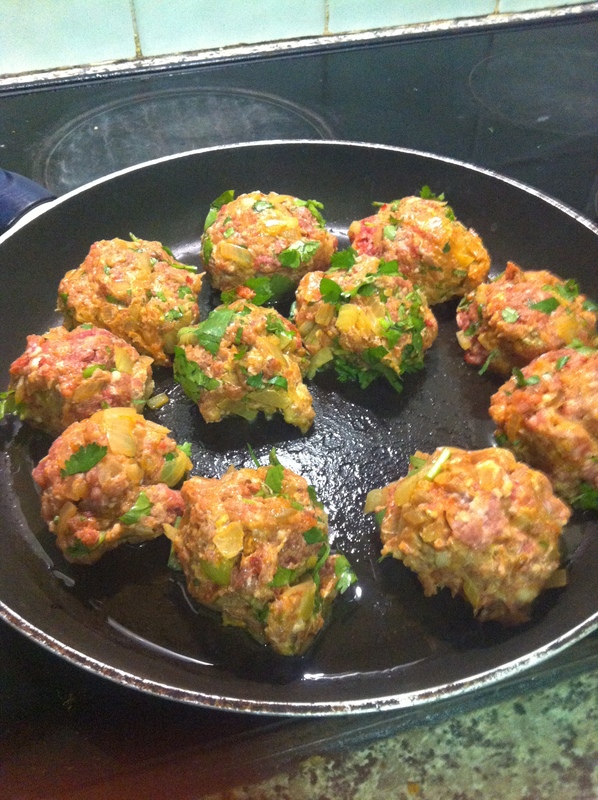 Then I pop the meatballs and eggs back into the oven to cook until the eggs set. 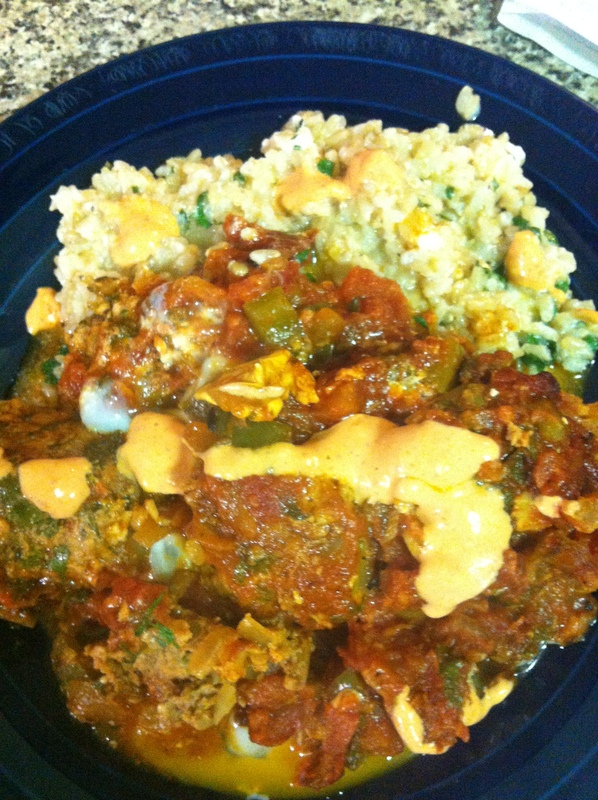 The Kofta (or is it Kofte) came out of the oven and I plated them up (sorry I’ve been watching a lot of My Kitchen Rules) with the Brown rice salad and some Harissa yoghurt and it was delish! The Runner was well pleased with it all, as was I! Huey, your bloody good recipes are BLOODY GOOD! < Previous Senseless. Tragedy. Why?